RECITE AAYATUL QURSI AT THE TIME OF LEAVING HOUSE BECAUSE 70000 ANGELS PROTECT PERSON FROM LEFT, RIGHT, FRONT AND BACK AND IF A PERSON DIES BEFORE RETURNING HE WILL GET 70 MARTYRS REWARD. RECITE AAYATUL QURSI 40 TIMES EVERY DAY AT THE TIME OF SUNSET, PERSON WILL GET REWARD OF 40 HAJJ. RECITE AAYATUL QURSI EVERY NIGHT AT BED, THIS CREATES ONE ANGEL WHO WILL GUARD THE PERSON TILL MORNING. 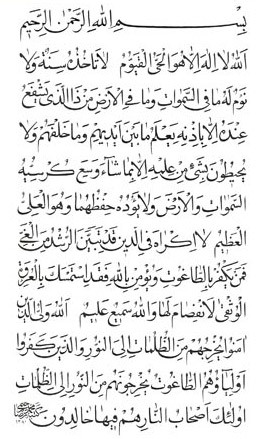 RECITE AAYATUL QURSI EVERY TIME AFTER DOING ABLUTION (WUZU) THIS WILL RAISE PERSON 40 TIMES IN RANK FROM EACH WORD. RECITE AAYATUL QURSI EVERY TIME AFTER RETURNING HOME BECAUSE IT KEEPS AWAY POVERTY.